I have admired Anoushka Thompson’s work as an events planner for quite some time now. She has a real eye for detail and can create props and decorations that I could barely dream up in my head, let al0ne bring to life. I am so happy that she has agreed to share a cool DIY project with us today. How awesome are these hay bale toppers? 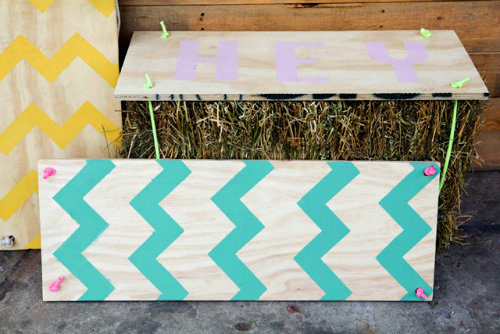 I am excited to stop by for the first of hopefully several DIY event posts for emerald & ella. After being a fan of the emerald & ella store, I ended up meeting Jane after she was a guest at a wedding I styled! Unbeknown to Jane her very own wedding was somewhat of an inspiration for this wedding too….so needless to say we’ve confessed our mutual admiration and I’m super happy Jane invited me to share ideas here on her beautiful blog. 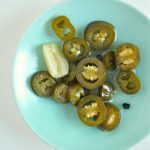 How good is the feeling of DIY? The same as in my job designing events, if you’re planning or styling your own event, being resourceful is your greatest asset. This doesn’t necessarily mean tirelessly hand making each and every element (even though some of you are probably those amazing gurus) but rather establishing what the occasion requires and set about filling those requirements using both your creativity and sensibility. Letting yourself imagine the perfect solution…does it exist or can you create it? Then letting your sensibilities take over…is it too expensive, or you don’t quite have the resources to pull it off? It’s okay if you end up back at the imaginary drawing board – simply have another go until you’ve ticked that box. 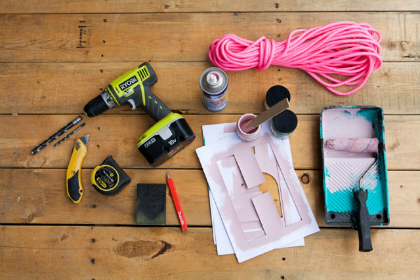 Maybe, you’ll end up hiring but if you’re committed to DIY the solution is there somewhere, amongst the resources you have access to – it’s just perhaps you haven’t seen it yet. 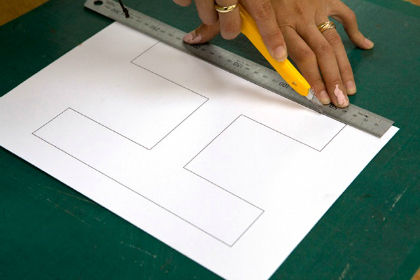 Have faith – this is ultimately how beautiful bespoke elements are created regardless of the budget! 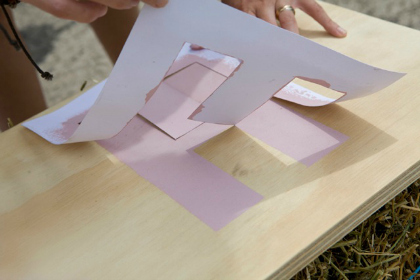 So – our first project is a plywood seat topper for hay bales – the first version of which I originally made for the above mentioned wedding, which featured a washed out white lace pattern utilising paper doilies as the stencil. However this time around I couldn’t resist making the Great! 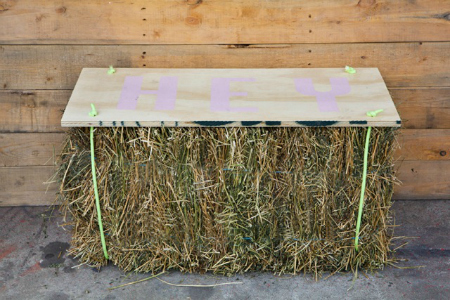 Sweet version aka: the “hey” bale, which was used as extra seating indoor and out for the Pop & Scott Workshop open day – which goes to show you can run with whatever design you like to suit and fit in with your occasion. 1. 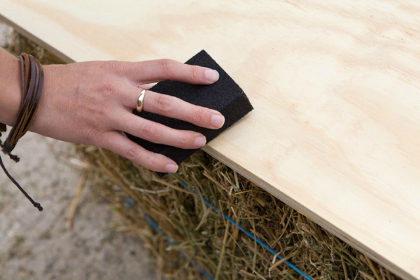 Decide which side of the hay bale makes the best seat (or coffee table for that matter) and measure it up for the plywood top. 2. 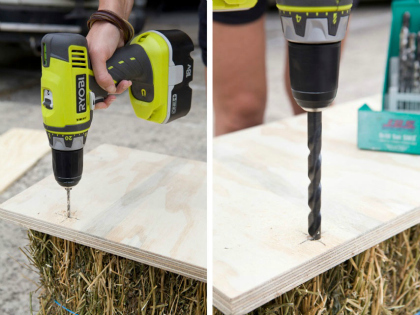 Once your tops are cut – either yourself or at the hardware store – you can drill holes for the rope. It will be easier to make a pilot hole first with a smaller drill bit and then drill through this same hole with a drill bit slightly larger than the rope size. 3. Give the tops and edges a nice old sand to smooth any rough edges or splinters, which could otherwise catch on people’s clothes. 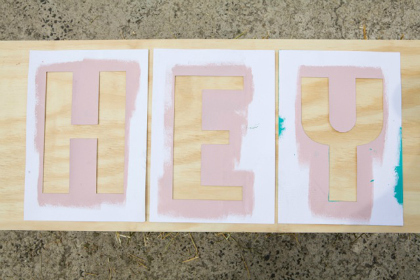 Wipe away the dust and you’re ready to start stencilling. 4. I found it easier to print the stencils on card and cut them out with a knife but you could buy/commission stencils or draw them free hand. Position the stencils on the plywood top and lightly pencil mark where the edges of the stencil will sit. 5. 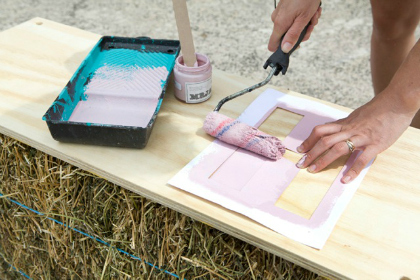 You could use masking tape or simply hold the stencils in place by hand as the weight of the roller and paint also helps to hold them flat. I couldn’t find the colours I wanted in spray paint so I rolled the paint on. I do recommend testing your chosen technique on the underside or an off-cut of ply first. If you’re using card stencils they may become paint logged after a few uses becoming difficult to work with so be prepared to cut out fresh stencils if you have a few tops to do. 6. Be extra careful when you lift the stencil off as I discovered that’s when smudges happen! If you do find the paint bleeds a little or you end up with the odd stray smudge wait until it’s dry, mask the good area with masking tape and sandpaper off the unwanted paint. 7. Once the paint is dry you can select your rope to suit and thread it through. I find it easier to leave it on the roll and cut what is necessary rather than measuring the exact amount of rope. Fix rope at both ends and your seat is complete! 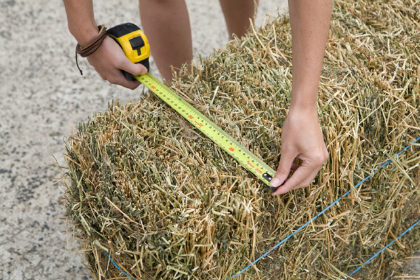 – Potentially easier to handle, assemble the hay bales once they’re in position rather than transporting them with the tops already attached. 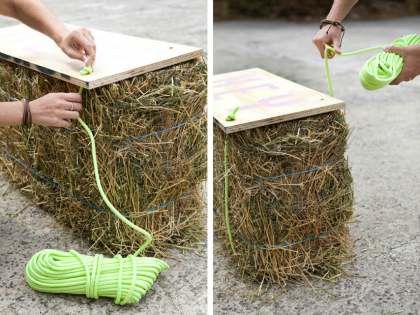 – If the twine holding the hay bales together is an uncomplimentary colour you could replace it with a neutral coloured twine – not sure about the bales holding together if you cut it off completely! 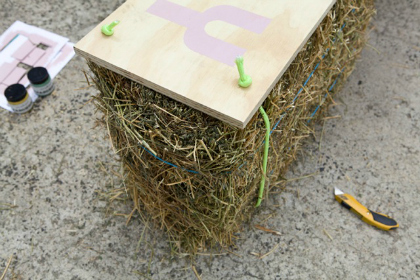 – Now you know what to do you can apply the same idea to milk crates, recycled bundled stacks of cardboard, cut & stacked pallet timber….it’s up to you! Anoushka is an event designer & creative and most recently the head and heart behind Great! 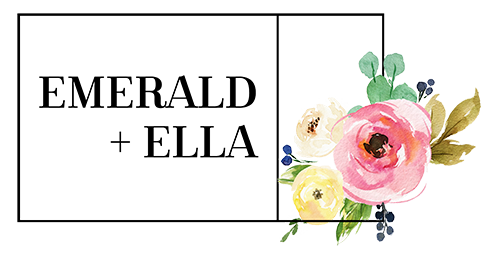 Sweet – an event, styling & design house based in Melbourne. Anoushka loves spare moments to design & build furniture with her husband Steve, bake for friends, write stories, shoot polaroids and fumble around with various gardening and craft projects which may or may not go to plan!